The reason I am contacting you, I guess, is to address something that you have done to Wheat Crunchies, which probably originally happened as a result of someone else complaining to you, more than likely an ICAN. In effect, I’m complaining about the result of someone elses complaint. 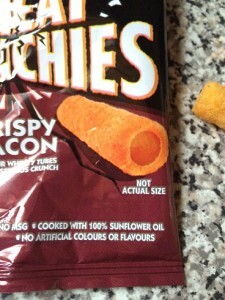 You seem to have added “Not Actual Size” disclaimers to your individual packs of Wheat Crunchies. I genuinely don’t understand why you have put it onto your packaging. I even mentioned this to a friend, to see if it was just me who didn’t understand, and she thought it was “madness”. It IS madness. Suggs won’t be happy. If I’m being honest, I’m one of those people who thinks things through slightly too much. If someone emails me to complain about something, I usually think through the situation from both sides so much that, by the end of it, I sympathise and can see the complainants point of view. But with your “Not Actual Size” disclaimer, I’m having trouble. I really, REALLY don’t know why you’ve added it. Because they ARE actual size. 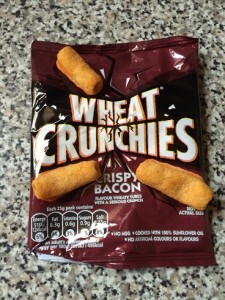 I eat Wheat Crunchies quite often. 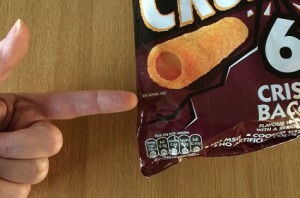 I have maybe three or four packs a week, and in each pack that I have eaten there have been crisps that are the EXACT SIZE of the ones on the packaging. Not all of them, admittedly, but each pack does contain crisps of the size depicted. LOOK! THEY ARE THE SAME SIZE! 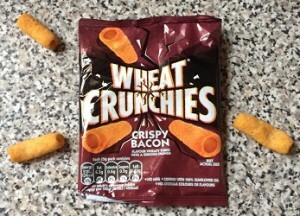 Don’t get me wrong, I love Wheat Crunchies. I like their taste, their crunch, the hand-to-mouth ratio is great and I like that you can block off one of the holes with your thumb, blow across the top of the other hole and make a shockingly loud whistle noise. Because of this final point, Wheat Crunchies are by far the loudest food I’ve ever eaten. Well done for that! 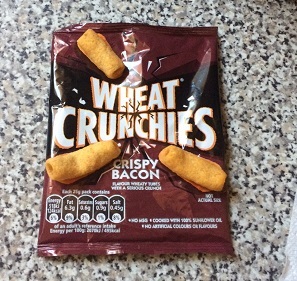 But EVERY packet of Wheat Crunchies that I have opened DOES contain crisps that ARE the actual size of the ones on the packaging. Now, I do appreciate that not every crisp in every bag is the same size as the depiction, but in that every pack does contain accurately sized crisps, surely this warrants a change of wording to your inaccurate disclaimer? You might as well change the wording from “Not Actual Size” to “Image indicative of actual size of some of the crisps, but this pack may also contain crisps that are a little bit shorter OR a little bit longer than the ones depicted.” After all, if you’re going to bow down to ICANs then at least make your disclaimer accurate. 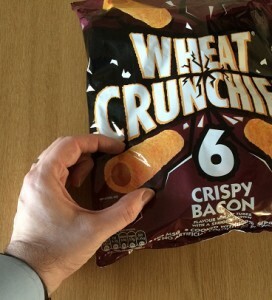 You’ve added the words “Not Actual Size” to the small packs that DO contain crisps that are the actual size of their representative image, but also added the same disclaimer to the multipack packaging on which the pictures are HUGE! 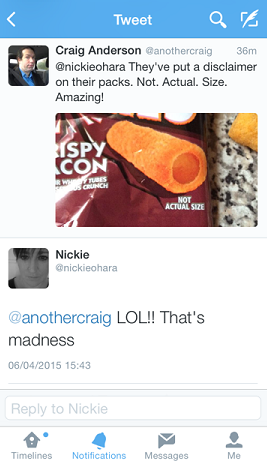 So has someone ACTUALLY contacted you, unhappy that the crisps they bought weren’t the size of a child’s forearm? SURELY your big packaging doesn’t really need to specify that they are “Not Actual Size”? Now stop wasting my time, you pedantic fool. 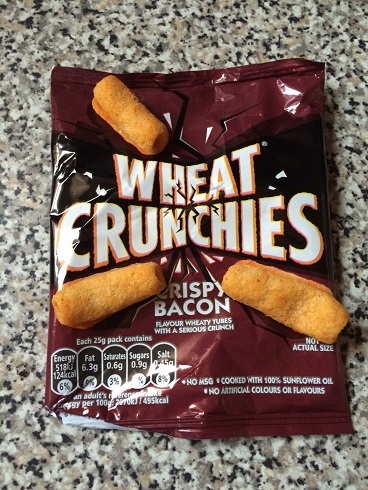 From The People at Wheat Crunchies. …and leave it at that. I’d really like to think that people are not that stupid to think that everything they see on adverts is “actual size”. I’d like to think that people who go into McDonalds and order a Big Mac don’t complain when it isn’t the size of the one on the display board, or people who go on holiday don’t complain when their hotel is bigger than the photos in the brochure. Maybe I’m wrong? I have been wrong once before, so I’m due another one soon I suppose. The point I’m trying to make is this: We really don’t need disclaimers for such blatantly obvious things, especially when they are inaccurate. Please consider removing it from your HUGE packaging, or at least make it accurate on your small packaging. But also bear in mind that if you’re keeping the disclaimer solely to cater for the 1% of people who need the simplest of things explaining, you’re insulting the intelligence of the other 99% of us who don’t need that sort of thing.